An extension cord-induced fire burned a mobile home in San Luis Obispo Tuesday evening. The overloading of power strips inside a trailer on a property at the corner of Orcutt Road and Johnson Avenue caused the mobile home to catch on fire. A single electrical extension cord connected the power strips to the main house on the property. San Luis Obispo and CAL Fire firefighters responded to the blaze around 6:05 p.m., but much of the trailer burned, resulting in more than $25,000 of damage. Firefighters achieved control of the fire within 13 minutes of the initial call, preventing it from spreading to the main house. Another home on the neighboring property was within 10 feet of the burning trailer, but it did not suffer any damage either. 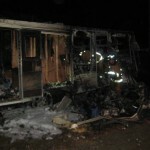 The lone occupant of the trailer was not home at the time, and no firefighter suffered any injuries. The San Luis Obispo Fire Department reminds the public to use extension cords for temporary purposes and not as permanent wiring.